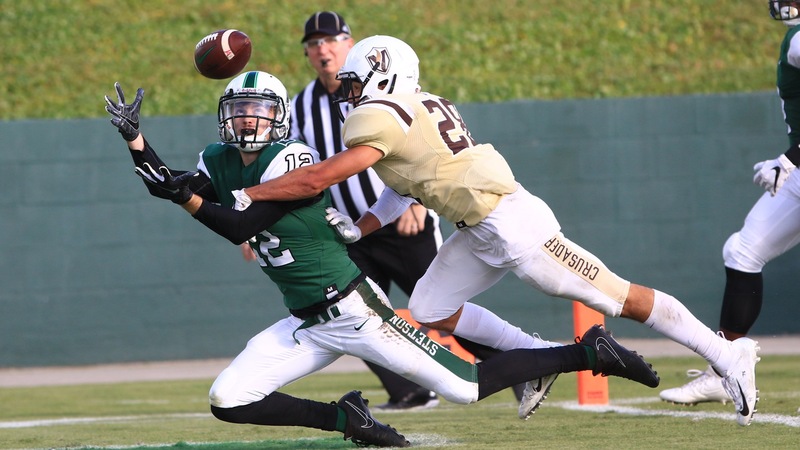 The 2018 season Stetson Hatters went out in style, taking a record-setting 45-31 victory over visiting Valparaiso at Spec Martin Stadium on Saturday to close out an 8-2 campaign. The eight victories tie for the most in a season in program history. Only the 1950 and 1951 Stetson teams had ever posted eight wins in a season before. 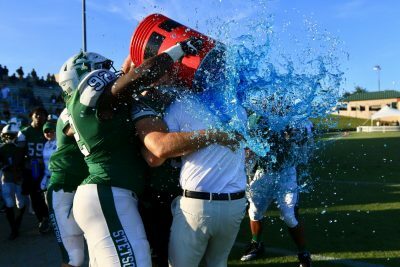 Stetson finished 6-2 in Pioneer Football League play to tie for second in the final league standings. Quarterback Colin McGovern set several records during Saturday’s game, including surpassing 3,000 passing yards for the season. 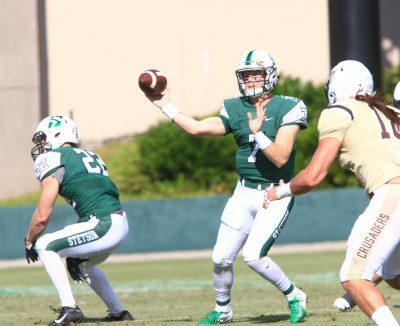 The records started falling early for the Hatters as senior quarterback Colin McGovern moved past Ryan Tentler in the Stetson record book for most career passing yards. It was not the last record McGovern, one of 13 seniors honored in pre-game ceremonies, would set in the game. McGovern finished the day throwing for a program-record 498 passing yards, completing 31-of-50 pass attempts, with six touchdowns, also a program record. The big day allowed McGovern to surpass 3,000 passing yards for the season – he finished with 3,028 – establishing the program mark in that category as well. Of course, McGovern didn’t pile up his gaudy numbers in a vacuum. Of his 31 completions, 12 went to senior tight end Donald Parham, for a school-record 257 receiving yards. That total surpassed the mark of 191 yards set by Kegan Moore against Butler in 2014. Parham also had three of McGovern’s TD passes, scoring on plays that covered 64, five and 53 yards. Donald Parham finished his senior season by averaging 146.6 receiving yards per game, which has a chance to lead all of college football, regardless of division, this year. Parham, who barely practiced during the week leading up to the game as the result of a high ankle sprain suffered at Butler last week, ran his program record career totals to 180 receptions for 2,591 yards and 20 touchdowns – all records. Parham finished his senior season by averaging 146.6 receiving yards per game, which has a chance to lead all of college football, regardless of division, this year. McGovern’s passing efforts also sought out some relatively unknown targets in the game as well. With regulars Steven Burdette, Justin Jordan and Jack Bowen all out with injuries, others had to step up. Sophomore Bensley Bornelus finished with a career-high seven receptions for 85 yards and two touchdowns while senior Luke McDermott posted career-highs with five receptions for 78 yards and his first touchdown. Even with all the record that fell, it was far from an easy victory. Senior Luke McDermott posted career-highs Saturday with five receptions for 78 yards and his first touchdown. The Crusaders opened the game with a six-play, 59-yard scoring drive that ended on a 19-yard pass from QB Chris Duncan to Parker Fox. The Hatters scored on their second drive of the game when McGovern found Parham on a short pass near the Valpo sideline before the big man dashed 64 yards to the end zone to knot the score at seven. Bornelus put the Hatters up 14-7 with a 14-yard TD reception early in the second quarter, but was flagged for excessive celebration after the play. That penalty was followed by a kickoff out of bounds and then a pass interference call to give Valpo a first down at the Stetson 35. The Crusaders cashed in that scoring chance on a one-yard plunge by Cody Boxrucker to tie the game. Moments later, after Stetson failed to move the ball on its possession, Valpo’s Matthew Messler blocked Stetson’s punt and Kellan McKeag recovered and scored on a 25-yard return for a 21-14 Crusaders lead. The Hatters celebrate with a post-game shower for the coach. Stetson answered with a classic two-minute drive, covering 70 yards in eight plays before McGovern hit Parham for a TD from five yards away. Valpo got a tremendous kickoff return from Bailey Gessinger with just 29 seconds left in the half, and the Crusaders took advantage when kicker Dimitrios Latsonas connected on a 50-yard field goal for a 24-21 lead at halftime. Stetson took control of the game in the third quarter, scoring on touchdown drives of 80, 51 and 76 yards. In that quarter, McGovern connected with Bornelus for 15-yard score to give the Hatters the lead. He then hit Parham for 53 yards and McDermott for a 23-yard score. The Hatters out-gained Valpo 227 yards to just 98 in the period. 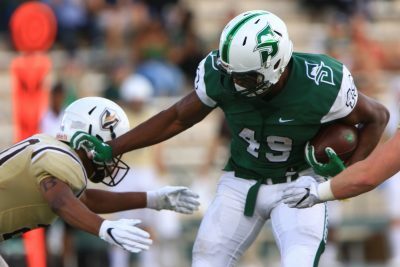 The Crusaders closed to within 42-31 early in the final quarter when Duncan capped a five-play drive with a 21-yard TD run, but the Stetson defense clamped down from there. Valpo’s next three possessions resulted in a punt, a turnover on downs and, after a 22-yard field goal by Stetson kicker Jonny Messina, a fumble. Stetson managed just 78 rushing yards in the game, thanks in part to three sacks against McGovern. Freshman running back Jareem Westcott did have a solid game on the ground, finishing with 19 carries for 81 yards. Defensively, the Hatters got another big game out of junior Colby Duncan who had a game-high 14 tackles, including one for loss, a fourth down stop and a forced fumble. Redshirt freshman Hunter Stephens and junior Reggie Gantt added six tackles each. Senior, and DeLand native, Jackie Jay Johnson – who may have competed in more football games at Spec Martin Stadium than anyone in the venue’s history with four years at Deland High School and four more at Stetson – closed out a great career with five tackles. Duncan completed 15-of-27 passes for 164 yards plus a touchdown while also running for an additional 88 yards and a touchdown to lead Valpo. Defensively, Messler led the Crusaders with 12 tackles.